Contrary to what Apple lovers believe, smart phones doesn't equal iPhone. Windows Mobile users who are looking for more traditional looking smartphones may want to take a look at the HP iPAQ 510 Voice Messenger. SPECIFICATIONS: The HP iPAQ 510 runs on Windows Mobile 6 OS, it has a 2 inch display, a 200 MHz OMAP processor, 64MB of RAM and 128MB of ROM, microSD memory card slot, Bluetooth, WiFi, 1.3 mega pixel camera and VOIP capabilities. ADVANTAGES: What I like about the HP iPAQ 510 is its traditional candy bar design. While most people view smart phones as somewhat Blackberry and iPhone looking, the HP just went with a simple design. If you're using Microsoft documents, you can view MS word, Excel and PowerPoint slide shows as well as browse the internet using Pocket Internet Explorer. The device also allows you to integrate your Company's Email using Microsoft Exchange. The HP iPAQ 510 also has VoIP and WiFi capabilities so you can save on mobile phone voice calls. DISADVANTAGES: While most PDA phones nowadays run on 400MHz of processor, with the iPhone having a 600MHZ ARM processor, the HP iPAQ 510's 200 MHz OMAP processor is definitely lacking and you may come across certain hiccups when trying to multi-task on the device. There's also no 3G connectivity, you're stuck using EDGE networks if you're trying to connect to the Internet away from a hotspot. 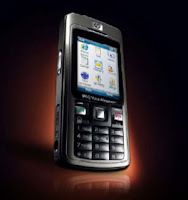 Since the HP iPAQ 510 went with the traditional candy bar design, expect a cramped keypad.